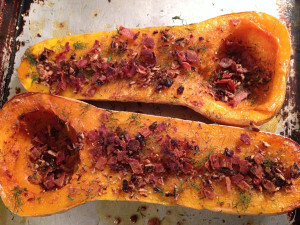 Butternut Squash: Has gained huge popularity over the past 10 years largely due to the restaurant influence and the popular butternut squash soup entree. It is a type of winter squash that has a sweet, nutty taste similar to that of a pumpkin – in fact often pumpkin pie is made from butternut squash. 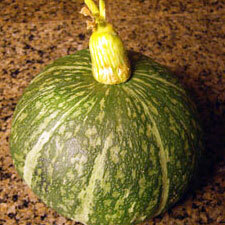 Kabocha Squash: The kabocha is hard, and is shaped like a squatty pumpkin with a deep green striped knobby skin. The flesh is a bright yellow-orange color on the inside. 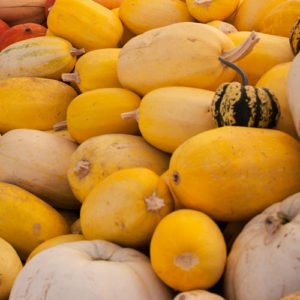 The average kabocha weighs between 2-3 pounds but they can weigh as much as 8 pounds. A cross between a pumpkin and a sweet potato, it has a naturally sweet flavor. Unlike other vegetables and fruits, after harvest the kabocha should be allowed to fully mature to reach it’s peak flavor – about 1 month after it is harvested. Just keep it on your counter while it ripens, you can safely keep it for up to 3 months! A fully ripened kabocha will have reddish-yellow flesh and a hard skin with a dry, corky stem. Spaghetti Squash: Spaghetti squash, also know as calabash squash derived it’s name because of the translucent strands of thin spaghetti that are produced when cooked. It has a very mild and delicate flavor that will take on the flavor of what it is served with. It makes an excellent substitution for pasta – with only 7 grams of carbs per cup!